Kayaking is the use of a Kayak for moving across water.At Flameback Lodges Mudigere India,I did my first recreational Kayaking in a double seated Kayak.Kayaking and Canoeing are also known as paddling. 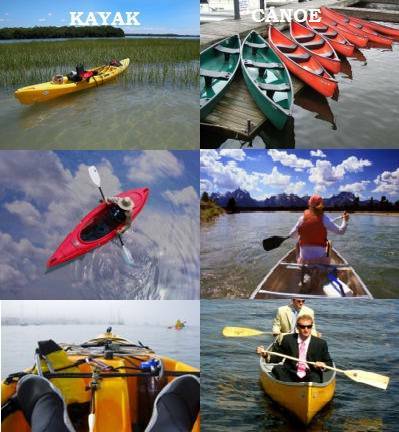 The difference between Kayaking and Canoeing are the number of people seated in the boat,the paddles and the seating position. White Water Kayaking : Whitewater kayaking involves taking a kayak down rapids, weirs and waterfalls. Recreational Kayaking : Recreational kayaking is ideal for individuals looking for a low impact recreational experience that can be done on ponds, lakes and slow moving rivers. Sea Kayaking : Sea kayaking, also referred to as ocean kayaking or touring, involves taking kayaks out on to the ocean or other open water such as a lake. The 12 km kayaking expedition in Rishikesh begins at Brahmapuri. It is a 2 day trip advised for beginner Kayakers to learn and experience first hand,the dangers rapids hold. River in Karnataka is perfect for amateur rafter and kayakers. There are plenty of rapids and plenty of nature to keep everybody hooked. It’s agreat place to learn the basics of kayaking and understand the waves better. Some of the suitable areas in Uttaranchal for Canoeing are Rishikesh, Dakpathar and the Ramganga in Corbett National Park. J&K Kayaking and Canoeing Association in collaboration of the J&K Sports Council and the Departments of Youth Services and Sports and Tourism had recently introduced Kayaking & Canoeing tournament in the state of Jammu & Kashmir. This is another event that is becoming popular amongst the people and the tourists in Jammu & Kashmir. The tournament takes place in Srinagar and works as a platform for the popularising water sports athletics. White water canoeing has wide possibilities in Lidder, Sindh, Drass, Suru, Indus, Zanskar, Chenab, etc. The National Level Kayaking & Canoeing Tournament, was on 8th Nov at Udaipur.It was also held at Ulsoor Lake in Bangalore. Lake Paradise, Nanital; Dal Lake, Srinagar; Manasbal Lake, Srinagar; Nagin Lake, Srinagar; Mumbai. 2)Andamans: Experience the perfect calm and the astounding silence with a kayaking trip through the mangrove treasures of Havelock Island. It is serene, picturesque and a great work out too! Who Does Kayaking in India? National Institute of Watersports is running a kayaking classroom training course/program in Panjim, or it has provided such training courses/programs before. On this 12-day course join 9 new friends and your instructors on a sea kayak adventure in the Boston Harbor Islands National Park Area. You’ll begin your sea kayaking adventure in the waters surrounding the Dampier Archipelago, a group of 42 rocky islands offering scrubby eucalyptus valleys and isolated coral reefs. While sea kayaking in Patagonia, you’ll encounter a variety of spectacular environments, from remote picturesque valleys with views of glaciated peaks to the wet and verdant coast. You may also have a chance to meet the people who inhabit the rugged land of Patagonia.